Pack of one ADDI KNITTING THIMBLE made from steel spring. For guiding 2 yarns when knitting stranded colourwork patterns such as fair-isle - the knitting thimble can help you control the different coloured wools as you work. The thimble helps you to handle and feed more than one yarn, thus avoiding getting them tangled. 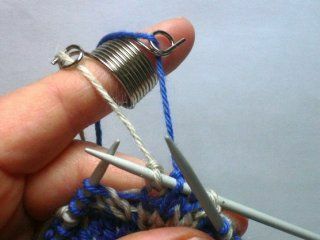 For Continental style knitting use as shown, where the yarn is fed from the left, wear the thimble on the index finger of the left hand (right-handed knitters!) so that the two colours of yarn are held separately and easily accessible.